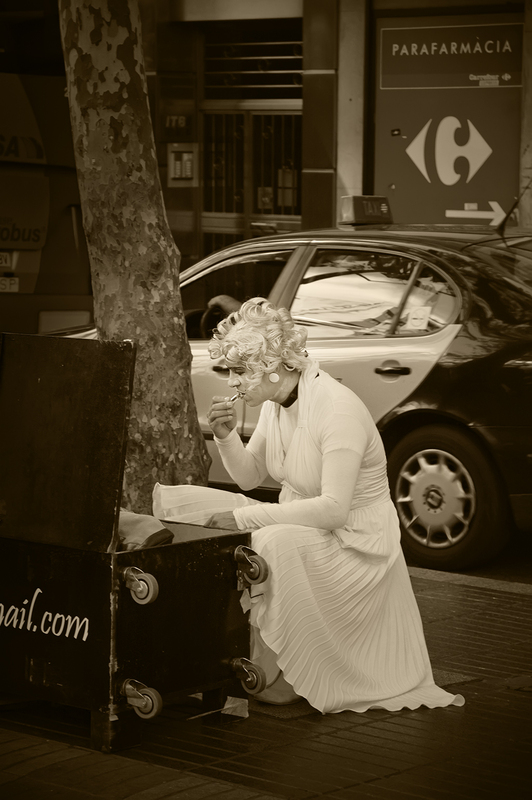 If human statues in Barcelona could stand all over the city at will, then this guy impersonating Marilyn Monroe, would certainly have chosen the air vents on Passeig de Gracia sidewalk not very far from Las Ramblas. Instead of that, he must compete with a bunch of other statues. You have the impressive rivals that are really hard to beat and many others that are simply ridiculous, way too many recently. Because my friends, crisis sharpens your survival skills and the boat is already full of survivors. Local authorities have plans to limit statues, starting January next year, to just 30, selected by their quality and working in two shifts (15 in the morning and another 15 in the afternoon) that will perform in a restricted area down Las Ramblas away from Plaça Catalunya, exactly between Pla de la Boqueria and Arc del Teatre square. Artists will be asked to send a CV and imitations of animals or characters carrying weapons will be banned. Let's see how it all ends as some attempts of regulation were made in the past with no success. Hey, I almost forgot Marilyn. You know what, I prefer to capture those moments when living statues are in the intimacy of the backstage sessions, when you can see the real people, lost in their own thoughts, maybe wondering what the heck they are doing on a pedestal all day without twitching a muscle. As I always say, please help the artist behind the statue. Don't pretend they are part of Las Ramblas decoration. Try as I might, I can't picture this guy doing a credible impersonation of Marilyn. There's something a little sad about this capture. I think it has to do with how raw and unvarnished this portrait is. Did you catch him in full pose? Nice capture. Not my type of pastime their work is. And it does not look entertaining to me as a tourist also. And yes, I saw the most number of live sculptures in Barcelona. Maybe the authorities are right. I like the photo so much. It feeds the brain, form and content are equals here, in our time of "form-the winner".. I love your pic. It represent what I like in photography: to catch a moment of the real life. A moment that express the reality. Beautiful work. Muy lindo momento de intimidad, and a poignant reminder of the person in the costume who is trying to make a living. I'm the guy behind the character. I'm surprised with the visual quality of that click. If you have more pictures of this performance, please send them to eating.warhol@gmail.com. Are u really? Well unfortunately I took no more pictures. Nice impersonation. Rules, rules, rules. Go Marilyn! HAHAHA! love this Shot man! Nicely captured. Good work Voxpox, I see you on the Ramblas often. Its such a civil servant mindset to want to control and regulate street art. I hope they don't suceed, its bad enough buskers need to audition and get a licence. First of all thanks for the kind comments everyone. Prithika I totally agree with that. I checked your blog and enjoyed some of the stories about the other Barcelona, the real one.